Rutherford Birchard Hayes (October 4, 1822 - Januar 17, 1893) wis the 19nt Preses o the Unitit States frae 1877 tae 1893. 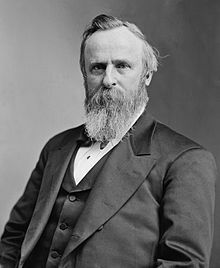 Wikimedia Commons haes media relatit tae Rutherford B. Hayes. This page wis last eeditit on 11 Februar 2017, at 05:02.